One month to go to enter the competition! 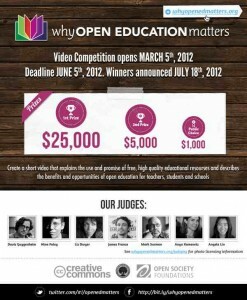 In March, Creative Commons, the U.S. Department of Education, and the Open Society Institute launched the Why Open Education Matters Video Competition. The goal of the competition is to raise awareness of Open Educational Resources (OER) and solicit short, creative videos that help explain what Open Educational Resources are and how they can be beneficial for teachers, students, and schools everywhere around the world. There's been lots of interest in the competition, and we wanted to remind you that the deadline to submit your video is June 5, 2012. The contest is open to all, and submissions can come from non-U.S. citizens. Nonprofits, schools, and companies may also enter a video, and you can work in teams. Please check out the website for all the information you need. The first prize is $25,000 and the second prize is $5,000. We've lined up some great judges to help award these prizes, including Nina Paley, Davis Guggenheim, and James Franco. There will also be a $1,000 Community Choice Award in which the public will be able to cast their vote for their favorite video. Again, video submissions must be received by June 5 on http://whyopenedmatters.org (look for the "Submit a Video" button). We’re eating our own dog food too--any video that is submitted must be licensed under the Creative Commons Attribution (CC BY) license so that it can be freely used and shared by anyone to help explain Open Educational Resources. Please jump in and share your creative video-making skills to explain and promote OER. Roll camera! Who's eligible to enter the competition?